Editor’s Note: We conclude Don’s insightful series on presidential inaugurations with a personal reflection on this year’s iteration. 6:00am is daunting. Mondays are unpopular. 20 degrees is startlingly cold. Three-day weekends are meant to be cherished. All four combined should lead to snooze-buttons, slow breakfasts, and a foot-dragging march to the metro—or just giving up and staying home. But Monday, January 21, 2013, saw the opposite for almost one million people from around the world. The 57th Presidential Inauguration, President Obama’s second (well, fourth, really) swearing in, was a once-in-a-lifetime experience and was not to be missed. I have only vague memories of the 2009 ceremonies. Still basking in the glow of fresh New Year’s resolutions, I watched part of the Inaugural Address from the gym at UCLA (probably the one and only early morning workout of my undergraduate career) before heading out into the warm Los Angeles morning, hurrying off to class, more focused on the lecture at hand than history in the making. Now I had a chance to attend the ceremony in person. Excited at the prospect of watching President Obama be sworn in for a second term (and further lured by the promise of seeing Her Royal Highness, Queen Beyonce, the ruler of all things great and awesome), I made plans to brave the Metro and the Mall on January 21. The night before, I hit the jackpot and came into tickets, close enough to actually see what was going on (even if everything was partly obscured by a rogue tree). We left the house at 7:00 am, were in line by 8:30, in by 9:30, and had two hours to spare before everything began. I will admit—the idea of attending the inauguration both excited and scared me. For the past 2 years, I’d heard countless horror stories—there aren’t enough bathrooms, it will be cold enough to kill William Henry Harrison, you’ll get trapped in a tunnel, etc. But I was determined to go anyway. And even with almost one million people crowded onto the National Mall, and my strong distaste for crowds, it was completely, 100% worth it. 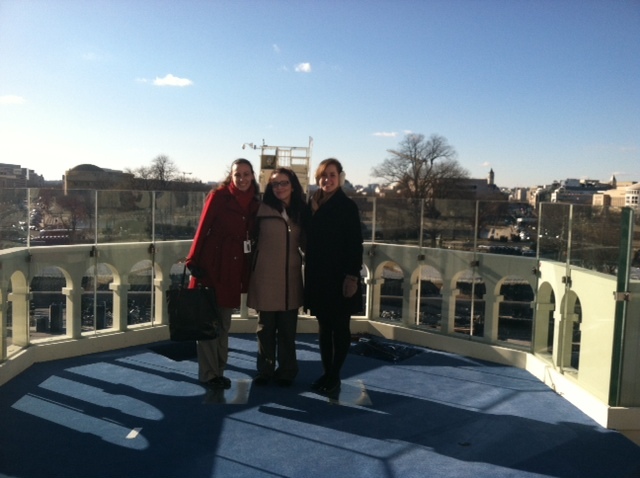 USCHS staff visited the platform outside the Capitol the day after the inauguration. I’ve voted in two presidential elections, but, voting in California and DC, I’ve never felt particularly influential. 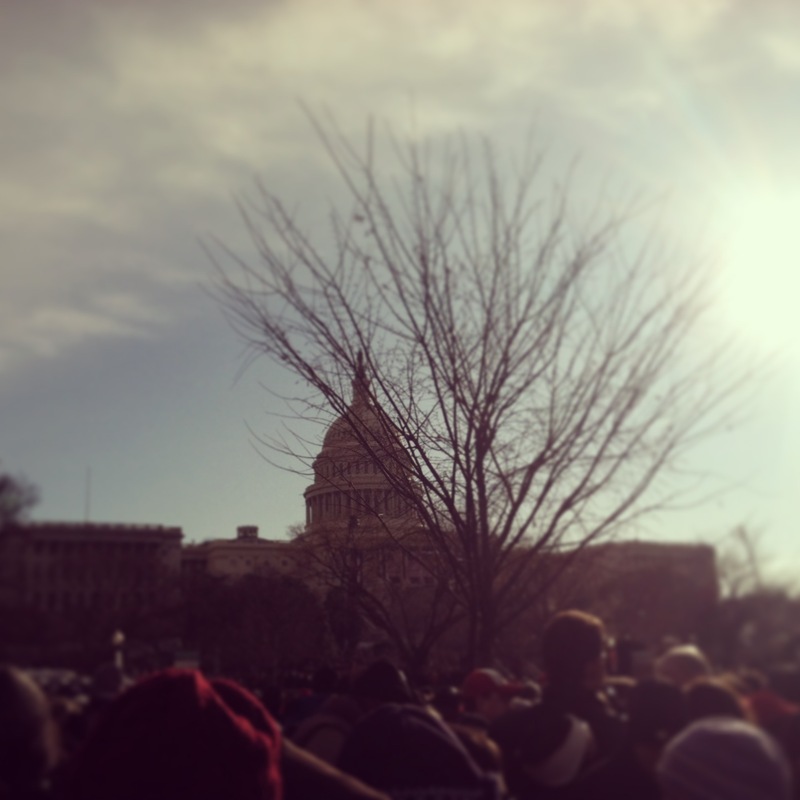 Being at the Inauguration was the first time I’d felt deeply, truly involved. I love American history, our cultural melting pot (mainly what it does to our cuisine), Broadway musicals and the Fourth of July. I find myself feeling stirringly patriotic staring at the Capitol dome, or seeing the Washington Monument rising at the end of my street. We are a nation of countless different desires, hopes, ideals, and ideas. Presidential elections give us a chance to check a box and pick between two people, choosing the one who best supports what we want as individuals. The match is usually far from perfect. It’s not about finding someone who will do exactly what you want. It’s about finding someone who you believe in, someone you trust to steer the country in the right direction. Not even necessarily to get us there, to bring us to the Promised Land, but just keep us on the right track. And at the Inauguration, I felt that hope, that belief, that passion, in everyone around me and inside myself. It’s what brings people to the polls. It’s what sends young people to fight for their country. It’s what wrote the Star Spangled Banner. It’s what makes America, America. And I am so glad to be a part of it. Several keen-eyed readers of yesterday’s Presidential Inaugural Quiz noticed an error in question 3, which had asked “Which two Presidents affirmed rather than swore the oath of office?” As these readers observed, only one President, Franklin Pierce, affirmed the oath. Herbert Hoover, whom many sources cite as having affirmed the oath, indeed swore the oath as can be heard in recordings of his inauguration. It had been assumed that as a Quaker, Hoover did not swear the oath. He did, as did Richard Nixon, also a Quaker. However, the evidence that Franklin Pierce affirmed the oath is clear and strong from contemporary accounts. Why he did so remains somewhat a mystery. Peter A. Wallner, the author of a two-volume biography of Pierce, could find no evidence of why Pierce chose to affirm rather than swear the oath. He speculates that perhaps Pierce did so for religious reasons or that he was just trying to perpetuate the myth of his personal humility. Whatever the motivation, Pierce’s swearing-in ceremony took place within the context of a terrible personal tragedy. Just two months earlier, on January 6, 1853, Pierce, his wife Jane, and their only surviving child, 11-year-old Bennie, traveled by train from Boston when the car in which they were riding plunged down an embankment near Andover. Pierce and his wife survived but they witnessed their son’s death. Jane Pierce, devastated by the experience, blamed her husband’s political ambitions for the accident. She remained a recluse during his presidency and did not attend the inauguration. There were no balls because of her mourning. A cloud of sadness seemed to hang over a “cold and cheerless” White House during Pierce’s presidency. There are a couple of other interesting side notes to Pierce’s inauguration. He recited his inaugural address from memory and his vice president, William R. King, did not attend the ceremony. King, terminally ill with tuberculosis, had gone to Cuba for his health, where he took the oath of office on March 24, 1853, twenty days after inauguration day. He died on April 18 and the office of vice president remained vacant for the next four years. Test your knowledge of the history of Presidential Inaugurals. Scroll to the end of the post for the answers. 1. Who gave the shortest inaugural address? 2. Who gave the longest inaugural address? 3. Which President affirmed rather than swore the oath of office? 4. 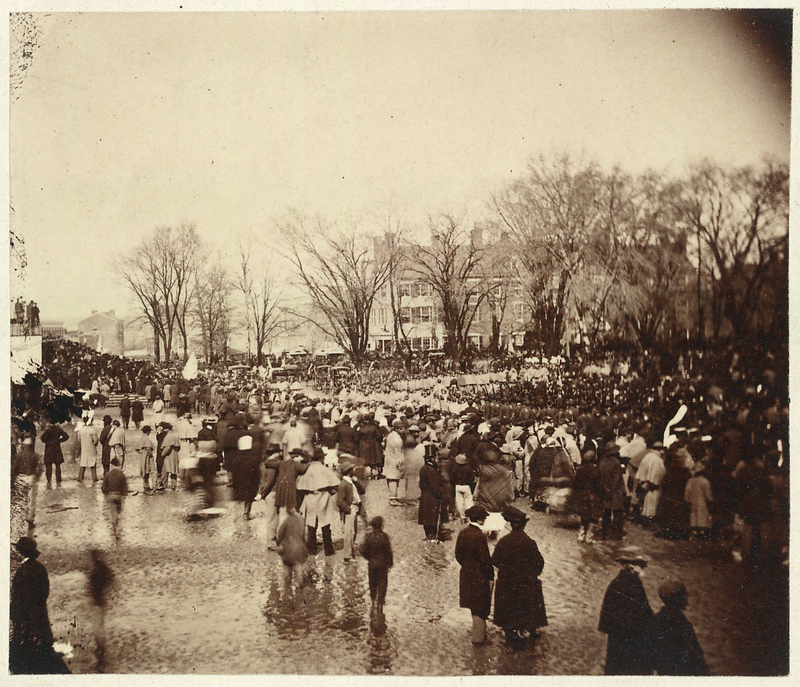 Which inauguration was the first known to have been photographed? 5. Which inauguration was the first recorded by motion picture cameras? 6. Which inauguration was the first to be televised? 7. Who was the first poet to participate in the inaugural ceremony and at which inauguration? 8. Which inauguration was the first nationally broadcast by radio? 9. Who was the first President to ride to and from the inaugural ceremony in an automobile? 10. Which President died one month after taking the oath of office? 11. Which inaugural ceremony had to be moved from the West Front inside to the Rotunda due to inclement weather? 12. For which inauguration were Army flamethrowers used to clear snow from Pennsylvania Avenue? 13. Which inauguration did Apache Chief Geronimo attend? 14. Which Chief Justice swore in father and son Presidents? 15. Which President was sworn in on an airplane by a woman judge? 16. Which inauguration took place on the South Portico of the White House? 17. Which President took the oath of office on a Sunday that was also “Super Bowl Sunday”? 18. Which inauguration was the first time a President’s mother was in attendance? 19. 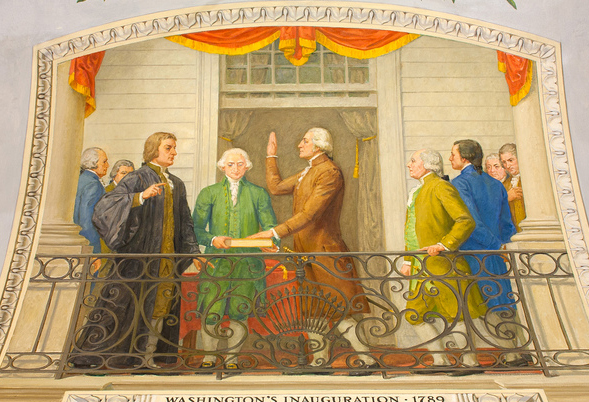 Since there is no firsthand report of George Washington saying “So help me God,” what was the first reported inauguration at which the President added “So help me God” at the end of the oath? 20. Which Chief Justice administered the Presidential oath of office the most times? The Capitol’s East Front remained the usual site for Presidential Inaugurations until 1981. 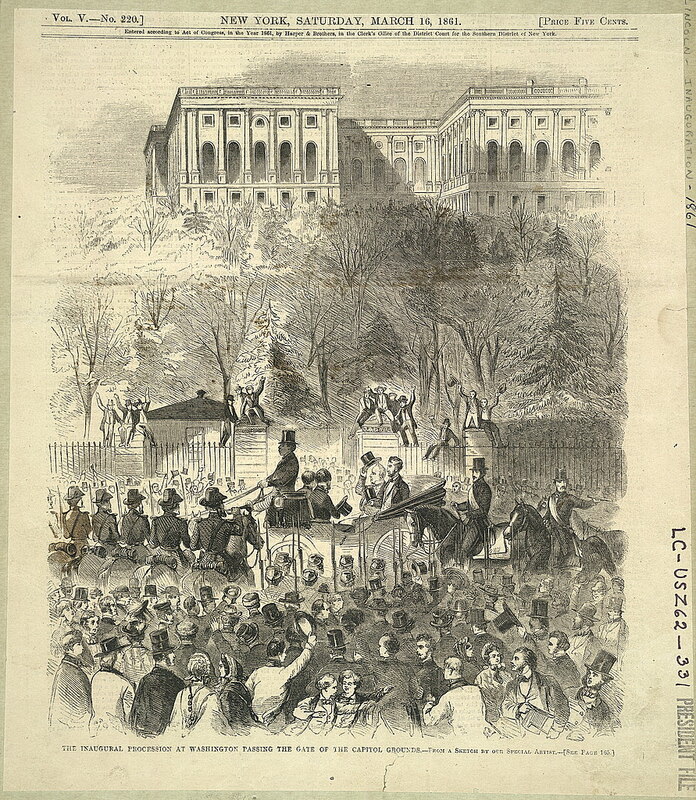 Abraham Lincoln’s first inauguration (March 4, 1861) took place in an atmosphere of danger and apprehension. Seven Southern states had seceded and Jefferson Davis had been inaugurated President of the Confederacy two weeks earlier. Because Maryland was a slave state of dubious loyalty, Lincoln had to slip into Washington unannounced. Troops guarded the inaugural route and sharpshooters were stationed on rooftops. Lincoln and departing President James Buchanan rode in an open carriage from the White House to the Capitol, flanked however by a mounted guard. The Capitol during the Civil War was still a work in progress. The two new wings designed by architect Thomas U. Walter and constructed by Army engineer Montgomery C. Meigs had been completed and occupied, but the cast-iron dome was still under construction. Its completion, Lincoln is reported later to have said, was a sign that the Union would survive the Civil War. 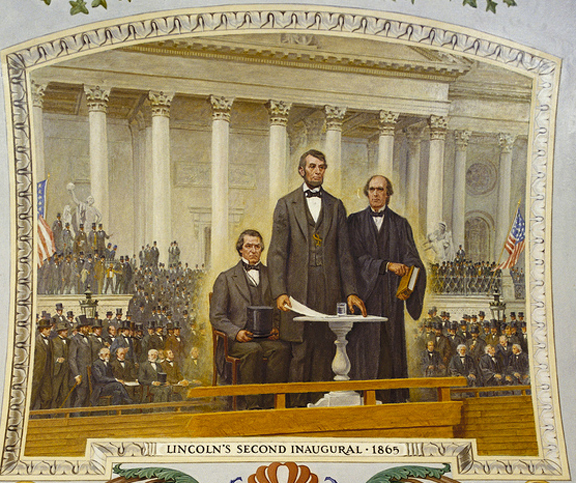 Lincoln’s second inaugural (March 4, 1865) came just as the Civil War was drawing to a close. The weather was appropriately sullen. Days of rain and wind had left streets nearly impassable with mud. A war-weary President ennobled the occasion with his inaugural address which many consider the greatest speech in American history. In our final Presidential Inauguration post on Monday, January 21, we’ll present an inaugural trivia quiz. Test your knowledge of some of the unusual facets of past inaugurations. Editor’s note: We’re continuing our series on Presidential Inaugurations. Click on the category listing above to see the other posts in the series. 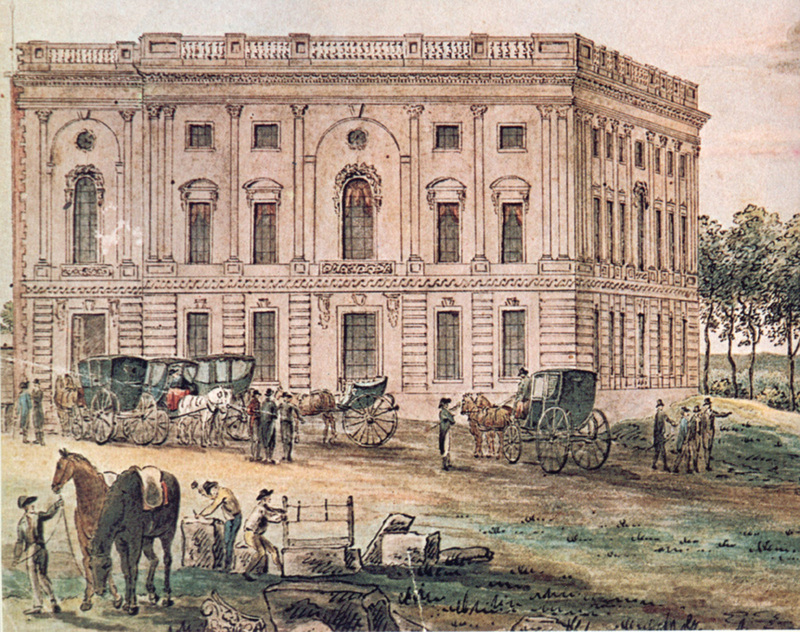 The inauguration of Jefferson’s successor, James Madison, moved to the larger House Chamber in 1809, which continued to be the site until 1829, with the exception of Monroe’s inaugural in 1817, which was held in front of the temporary Old Brick Capitol because the restoration of the Capitol had not been completed following the fire set by British troops in 1814. 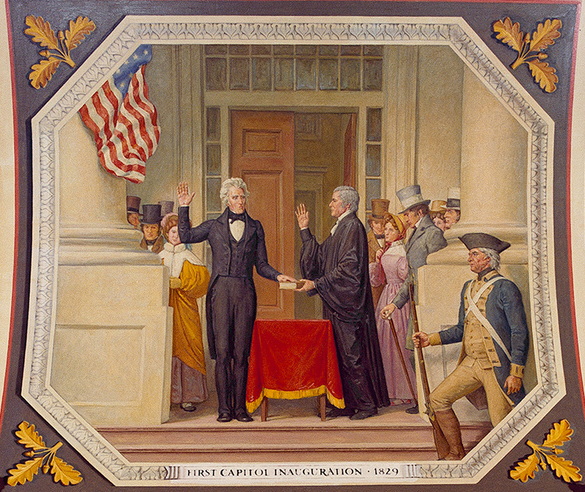 In 1829, however, the inauguration of Andrew Jackson as the seventh President of the United States moved the ceremony outside the building to the East Portico of the Capitol. Outgoing President John Quincy Adams, Jackson’s bitter political enemy, decided to boycott the ceremony, just as his father had left town before Jefferson’s inaugural in 1801. Quincy Adams vacated the White House and chose to go horseback riding on the inaugural day. Jackson, who was in mourning following the death of his beloved wife Rachel, wore a plain black cloth suit and a black mourning band on his hat. He walked from his room at Gadsby’s Hotel to the Capitol accompanied by fifteen Revolutionary War veterans. “Thousands and thousands of people, without distinction of rank, collected in an immense mass round the Capitol, silent, orderly and tranquil, with their eyes fixed on the front of that edifice, waiting the appearance of the President in the portico. The door from the Rotunda opens, preceded by the marshals, surrounded by the Judges of the Supreme Court, the old man with his grey locks, that crown of glory, advances, bows to the people, who greet him with a shout that rends the air, the Cannons, from the heights around, from Alexandria and Fort Warburton proclaim the oath he has taken and the hills reverberate the sound. It was grand,—it was sublime! Prior to 1937, Inauguration Day was set on March 4th, as specified in the Constitution (the 20th Amendment changed the date to January 20th). The first inauguration, however, didn’t take place on March 4, 1789, but nearly two months later on April 30th. The First Federal Congress had convened on March 4, 1789, in New York City but the House of Representatives and the Senate each lacked a quorum necessary to do business, including counting the electoral votes cast for President and Vice President. 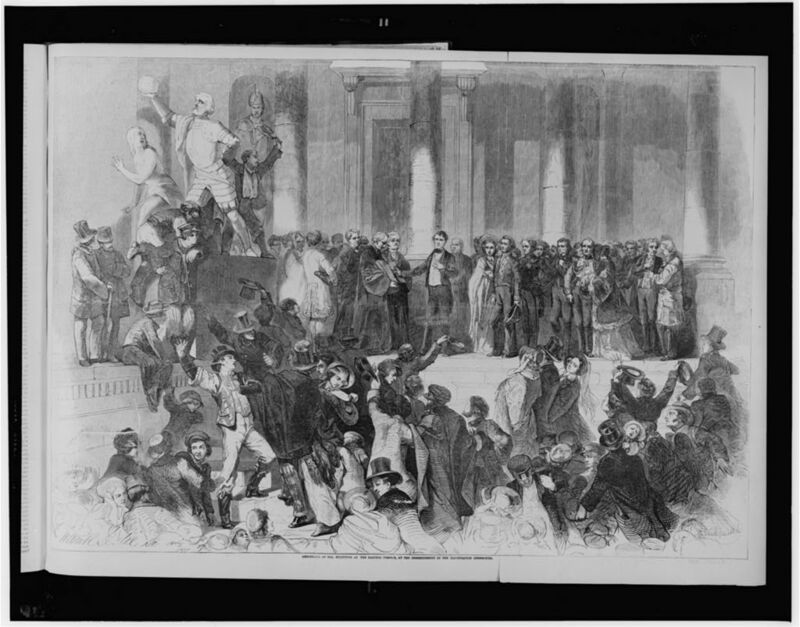 On April 6th, enough Members had arrived to count the votes and declare Washington the winner. Congress dispatched Charles Thomson, the secretary of the old Continental Congress, to Mount Vernon to inform Washington of his victory. Thomson arrived at Mount Vernon on April 14 and two days later Washington started out for New York on a week-long triumphal procession which began one precedent no longer observed. Prior to 1889, inaugural parades went to the Capitol, accompanying the President-elect as he went to take the oath of office. The first post-oath parade was for Benjamin Harrison and included Buffalo Bill Cody and a group of cowboys. Because Congress met in Federal Hall, Washington went there to take the oath of office on April 30th. He went to the Senate Chamber on the second floor (hence the Senate has ever since been referred to as the upper house), where he was escorted out to the balcony to take the oath. Because there were no Supreme Court justices, the oath was administered by Robert Livingston, Chancellor of the State of New York. The Bible used in the ceremony was borrowed from nearby St. John’s Masonic Lodge when none could be found in Federal Hall. When Washington finished taking the oath, Livingston turned to the crowd and said, “Long live George Washington, President of the United States.” The flag was raised, artillery fired, and church bells pealed. The President then went back into the building and delivered his inaugural address in the Senate Chamber before both Houses of Congress. Trying to avoid falling off the fiscal cliff is not the only thing going on at the Capitol these days. 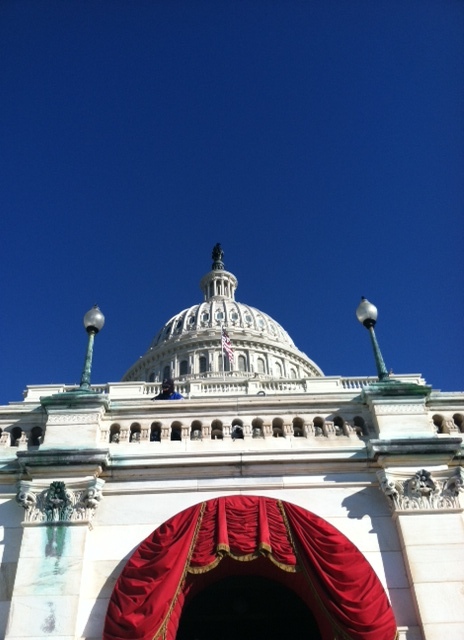 Since September, even before the results of the presidential election were known, the Capitol has been getting ready for the inaugural ceremonies on January 21, 2013. The lower terrace of the West Front has been closed and fenced off for construction of the inaugural stands. 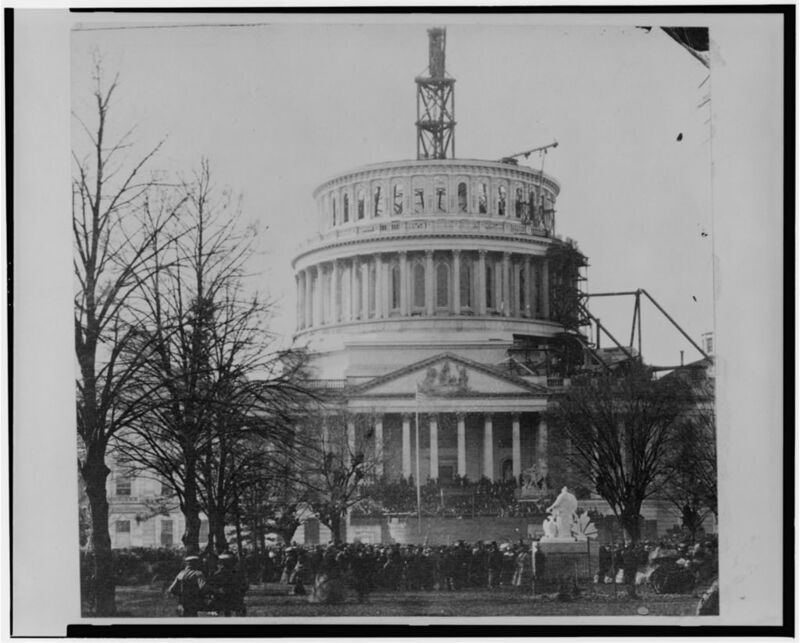 In anticipation of the inauguration, we’re presenting a series of posts on the history of Presidential Inaugurations, focusing on the Capitol connection. We’ll start with some general observations. First, Presidential Inaugurations are the most significant public rituals of American representative government. Unlike the coronation of a monarch or any ritual associated with the rise to power of a dictator or autocrat, the inauguration of the American President is a cyclical, regularly scheduled event held every four years. The regularity of Presidential Inaugurations lends a sense of reassuring stability, continuity, and permanence to a political system that permits turnover in officeholders and change in policy agendas. Moreover, it is a peaceful change in government, unlike the turmoil and violence that so often has accompanied a change in head of state elsewhere. Second, why is the Chief Executive’s oath of office customarily administered at the Capitol, the seat of the legislative branch of government? In part, it’s a reflection of how the President is elected. The Electoral College ballots are counted by Congress, which then certifies the election of the President and Vice President and notifies the winners. Moreover, the Capitol provides an appropriate political theater for the symbolism of the inaugural ritual. The oath is administered, normally when weather permits, outside, in the presence of the public—the electorate who chose the President. The President-elect and Vice-President-elect are surrounded by Members of Congress, past and present, Justices of the Supreme Court, members of the diplomatic corps, and other dignitaries as the Chief Justice of the Supreme Court administers the oath of office. In this way, all three branches of the federal government and the public they serve are symbolically linked in this ritual of renewal and reaffirmation. One final observation: Just as other ritual ceremonies are followed by feasts and celebrations, the remainder of Inauguration Day takes on the form of festival. The now sworn-in President joins Members of Congress for lunch in the Capitol before traveling back to the White House at the head of an increasingly elaborate parade. The day is then completed with festive Inaugural Balls at various locations around the city. In the next post we’ll take a look at the first inauguration—George Washington’s in 1789 in New York City—which, although it did not take place at the current Capitol, did set several precedents still followed today.